Dan Walters is the dean of California columnists. But sometimes he gets one wrong. In the wake of ex-Gov. Arnold Schwarzenegger’s personal problems, attacks have increased on Arnold’s performance as governor, especially on the budget — which he left $25 billion in the red. Walters’ column is titled, “Arnold Schwarzenegger can’t be blamed for California’s chronic mess” on the budget. Now that the tabloid feeding frenzy has abated somewhat, it’s time for a cooler look at the furor over former Gov. Arnold Schwarzenegger’s fathering a child by one of his household workers. A few pundits have tried to make the connection between his marital betrayal and his failings as governor, but one has nothing to do with the other…. Mostly, Schwarzenegger failed not because of his own lapses, but because California’s political structure generates failure regardless of who occupies the office. Brown, who has spent all of his adult life in politics, is not faring any better than Schwarzenegger on the budget. But Arnold was elected in 2003 on promises that he would “cut up the credit cards” of the state and “blow up the boxes” of bureaucratic waste. He didn’t. After he took office in November 2003, he repeatedly was urged to deal with the state’s chronic budget deficits by putting on the ballot a restoration of the Gann Limit, which limited the increases in the budget to the increases in population growth plus inflation. Had he done so, voters overwhelmingly would have approved it, the budget would have been balanced every year, and Arnold would have left office a political hero. He didn’t. 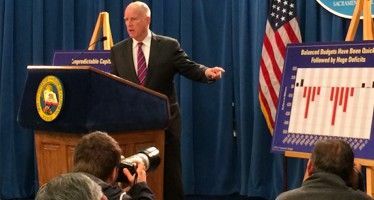 Instead, in March 2004, he placed on the ballot Proposition 57, a $15 billion bond measure to borrow money until budget revenues recovered; and Proposition 58, the California Balanced Budget Act. As we have seen, the latter was another toothless attempt to require a balanced budget. At the time, several people warned that the Gann Limit’s restoration was the only way the budget would be balanced; that Arnold’s ballot measures just kicked the can down the road. These people included then state-Sen. Tom McClintock (now a U.S. Congressman), and the editorial writers at the Orange County Register: my current CalWatchDog.com colleague Steven Greenhut, the late Alan Bock and myself. So, Arnold really is to blame for the continuing budget mess. As his friend Milton Friedman, the late free-market economist and Nobel laureate, wrote in “The Tyranny of the Status Quo,” a reform-mined politician only has about 100 days after his election to enact reforms. During that time, the voters who put him in office are behind his reforms. After that, the “status quo” takes over, and it’s almost impossible to change things. But there’s more. During the mid-2000s, the phony real-estate boom inflated government budgets everywhere, especially in California. Many people, including myself, warned that this was not a real boom, as happened during the 1980s, in which President Reagan’s tax cuts produced real, tangible new products and sustainable growth. Instead, the real-estate boom was caused by the U.S. Federal Reserve Board printing too many (causing our current inflation) and keeping interest rates artificially low. A crash was inevitable. Arnold didn’t care. For him, it was “let the good times roll.” For fiscal year 2005-06, he increased spending an incredible 15 percent, to $91.6 billion. The next year, fiscal 2006-07, he boosted spending another 10 percent, to $101.4 billion. Contrast that with Gov. Jerry Brown’s May Revise to his January budget, which calls for spending of $89 billion for fiscal 2011-12. And even that would occur only if he gets about $10 billion in tax increases. Basically, today the sustainable budget (without tax increases) is about $79 billion — compared to the $101.4 billion in super-spending Arnold blew five years earlier. 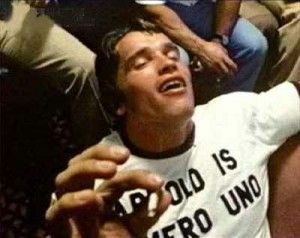 What about his vow to follow the will of “the people” Arnold always invoked? He cared about that as much as his wedding vows. Arnold was supposed to be the “gatekeeper” who prevented the spendthrift Democratic Legislature from raiding the treasury. Instead, he opened the gates and joined in the looting. Arnold could have simply refused to increase spending beyond a 5 percent increase per year, about the level of population growth and inflation. That is, he could have insisted that, although the Gann Limit had been repealed, he, the brave Terminator, would impose it through his own will and force the “girly men” in the Legislature to do his bidding. Instead, he was the “girly man” who caved in under pressure. I really wonder whether this was caused, at least in part, by his knowing that scandals were brewing behind the scenes, especially the one with his “love child.” And we still don’t know what else might be revealed. His betrayal of his family is a personal matter. His betrayal of California on the budget continues to cause massive pain to us all. A common error people make is to think that just becuase some political hack slects to have a “R” after his name that he believes in freedom and small government. Very few of the “R” type hacks believe in anything except personal power, how to get it and how to climb the ladder to higher office. True dat, Cicero. They’re no different than those guys with the “D” behind their names. Self serving incompetent crooks, all of them. Yet we keep sending them back. There was an earlier Cicero who lost both his head and his hands for speaking against the status quo. And to think that Tom McClintock, a candidate who knew budgets, could have won the recall election for governor in 2003 if Schwarzenegger had not run.